Sue - those sandals were red! 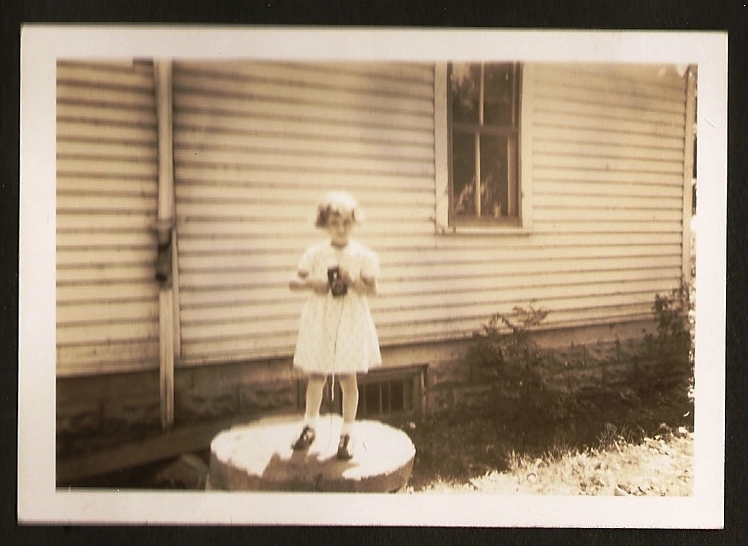 When being "bigger" meant inheriting Mom's old Brownie camera? When we spent all our allowance on getting tiny black and white photos developed at our local Drugstore? When we first saw real, although poor quality, COLOR photos? When you could take Polaroids - and had to brush something over the picture to make it develop? When you could get pretty good color Polaroids - and they have faded drastically over time? And now you can store hundreds of photos on a "flash" drive and carry them in your pocket - older is not always better. Buying a film and having it developed and printed was a major investment of pocket-money when I was young! I remember having to ensure that the camera was opened in relative darkness to ensure the roll of film wasn't spoiled on removal. Until the early '60s I'm pretty sure colour film had to be sent overseas (Australia?) for processing. Looking at family colour-slides with projector and screen was a delightful way to spend an evening. I had a 35mm camera when I was in high school and took a lot of colored slides. Once in awhile I would have one I liked printed but as you said that was expensive. Used my babysitting money for film and prints. Our Aunt took lots of slides including a trip to Europe and to Holland when the tulips where in bloom so much fun to look at.